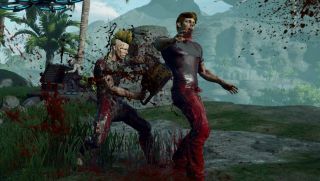 In many ways (aside from the title), The Culling sounds like a fairly conventional multiplayer sandbox survival game, requiring players to explore, scavenge items, craft weapons, and build traps. But beyond that, things take a turn for the murderous. Matches run for just 20 minutes, and each of the 16 players has a single, simple goal: Kill everyone else. Developer Xaviant, whose previous project was the very decent action-RPG Lichdom: Battlemage, says The Culling is “the first stand-alone entry in the battle royale genre,” in which murdering your fellow players is the goal and not just something that happens now and then as a result of necessity or boredom. It will support free-for-all or team-based play, with 24 melee weapons and an unspecified number or ranged weapons, including guns—although they'll be rare, and ammunition in short supply. Xaviant hasn't yet said what sort of payment model The Culling will use, but it will employ its own in-game currency called Func (Flexible Universal Nano-Compound), which can be spent to craft items, call in airdrops, and open certain types of chests. The Steam description says Func is gained through combat and exploration, but I wouldn't be surprised to see it purchasable with real money as well. At the end of each match, “cosmetic items” that can be traded on the Steam Market will be awarded, apparently to everyone involved: “No contestant leaves a match of The Culling empty-handed,” it says, although higher-grade items will naturally be reserved for those who perform well. The long-term goal is to build The Culling into a popular esport, and I can see that happening fairly easily. I'm not sure how this speaks of me as a person, but 20 minutes of unbridled homicide in a tropical island paradise—all simulated, of course—sounds like a lot of fun. The Culling is set to go live on Steam Early Access on March 8. In the meantime, there's also H1Z1's Battle Royale mode, which Chris Livingston journaled in detail.